This move not only enabled the Gala Coral Group to offer more brand products, but it allowed the company to acquire the necessary iGaming licences to offer virtual betting. Today, following a merger with Ladbrokes in 2016, Coral Casino is now one of the largest online platforms in Ireland. In fact, despite being a relative latecomer to the industry, Coral's calculated moves and mergers have allowed it to become one of the leading operators in 2019. From themed video slots like Rocky and Captain America, to casino classics like Great Blue, Funky Fruits Farm and Mr Cash Back, Coral Casino has everything you need and more. In fact, just as the likes of NetEnt, Microgaming and NextGen Gaming offer progressive jackpot slots, Playtech also offers its fair share of big money games. Regardless of your gaming persuasion, you can play networked and standalone jackpot slot machines with prizes worth upwards of €100,000. 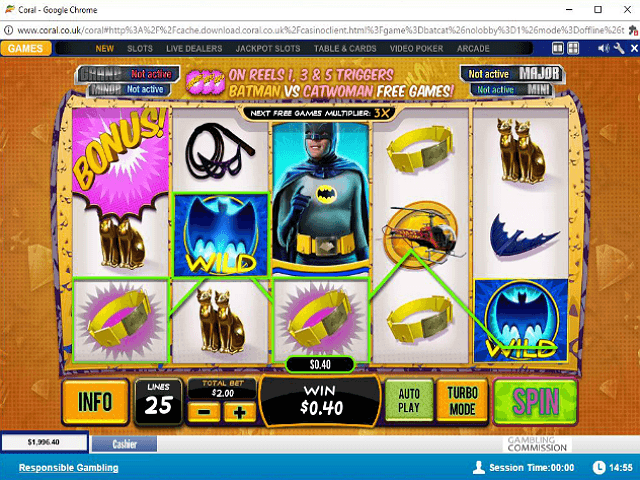 Jackpot Slots – If you're in the market for big money payouts, the jackpot slots are the kings of the castle. Thanks to Playtech's licensing deals with companies like Marvel, you can play movie-themed games that are both attractive and capable of dispensing €100,000+ prizes. Coral is fully loaded with progressive jackpot slots thanks to its relationship with Playtech. Housed in a tab that's naturally titled "Jackpots", these progressive slots are the best way to win a lot from a little. 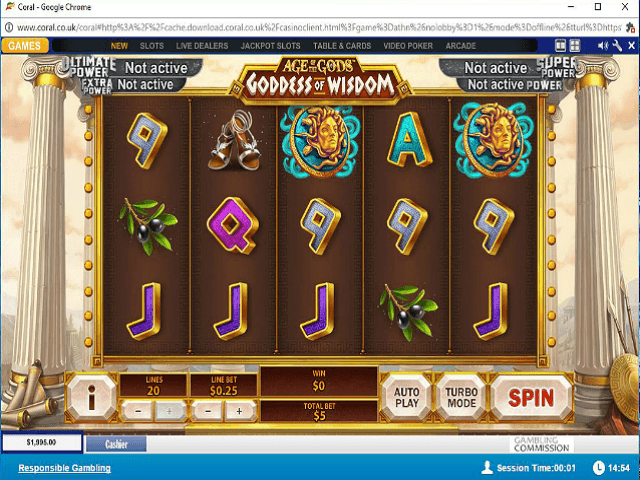 One of the highlights of Coral's selection of big money spinners is that it contains standalone games and networked games. Each medium has its own advantages, but whichever option you choose, the progressive jackpots will easily top €100,000. In fact, when you play jackpot slots like Monty Python's Spamalot or Jackpot Giant, the money on offer will be in excess of €1 million. 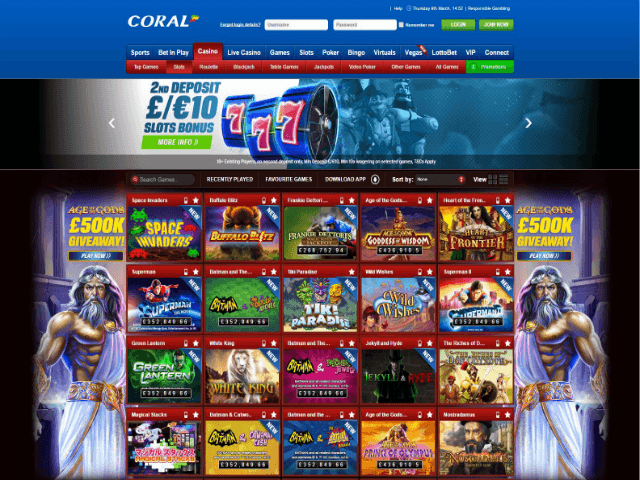 Depositing and withdrawing at Coral is highly secure thanks to full SSL encryption, recognised Irish payment methods and the UK Gambling Commission's oversight. Backed by these factors, Coral is able to offer minimum casino deposit options from €5. Not only that, but each of the payment methods can be used for fee-free casino withdrawals that will be processed, on average, between 2 to 5 working days. How do you get more for less at Coral Casino? Simple: take advantage of the latest offers and promotions handed out by Coral Casino's bonus elves. At the top of the shop, new players can get a welcome bonus worth €50 and, what's better, you only have to deposit €10 to get it. This casino bonus is one of the most accessible in the industry and all you have to do to unlock this free cash is to wager 24X the bonus amount.